Ground launched cruise missile (GLCM) weapons systems being destroyed in accordance with the Intermediate Range Nuclear Forces (INF) Treaty at Davis-Monthan Air Force Base, Arizona, USA. The treaty required the elimination of all ground-launched nuclear and conventional missiles with ranges of 500 to 5,500 kilometres by the 1st June 1991. 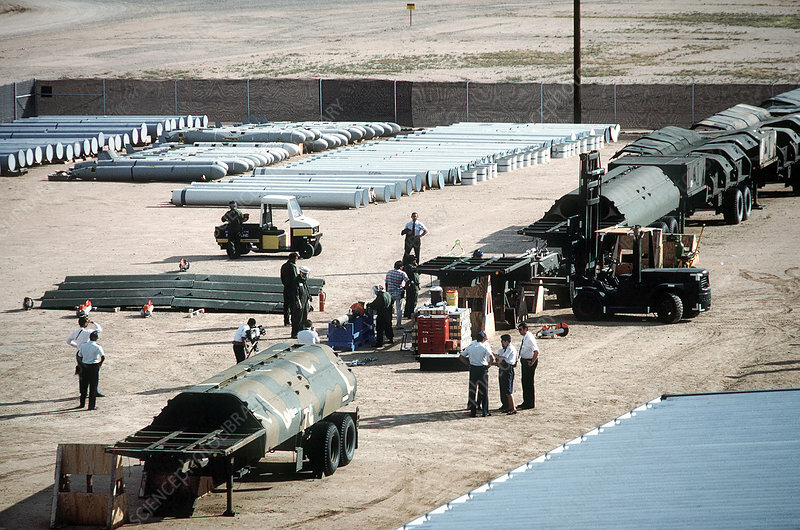 Forty-one GLCMs and their launch canisters and seven transporter-erector-launchers were disposed of at the base in the first round of reductions mandated by the treaty. Soviet inspectors were on hand to monitor the destruction of the weapon systems.